Mexican Decorative Ceramic Box with Hand Painted Motifs, "Guanajuato Pride"
Cerulean blossoms abound on this decorative ceramic box from Mexico's Javier Servin. 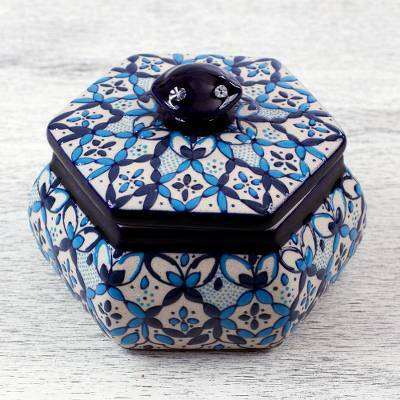 Accompanied by indigo blue accents, the motifs are painted by hand before the box is fired in the kiln, resulting in a beautiful enamel-like finish. The hexagonal box is the perfect place for stashing small treasures.